Meet Sammy, a four-year-old Corgi-Sheltie rescue dog! 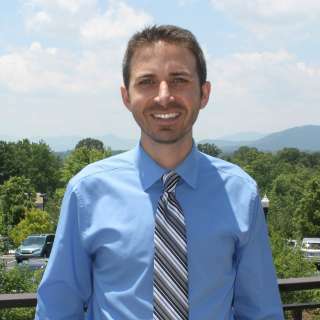 He loves to hike and catch Frisbees in his dog-friendly hometown of Asheville, North Carolina. And, word around the dog park is that he’s been known to climb trees in pursuit of squirrels. Every dog has his day and this is Sammy’s dream day of adventuring here in the Blue Ridge Mountains! Watch below! It’s easy to have a ball in Asheville with your best friend! 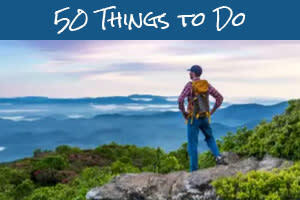 Here&apos;s how to explore Asheville just like Sammy! Welcome to Dog City USA! Asheville is home to the first official "dog welcome center" in the United States. A warm and fuzzy introduction to Asheville awaits you and your dog at the Dog City USA Welcome Center. It&apos;s located inside the Dog Door Behavior Center and Store next to the historic Grove Arcade. Get your paws on a list of the top 100 dog-friendly attractions and services in the city and browse the store’s toys, chews and other dog necessities. Sammy received his training from The Dog Door’s owner, Kim Brophey! 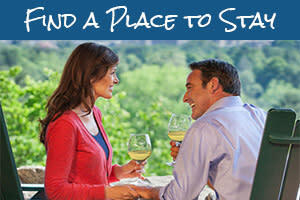 Just blocks away, the humans in the group can pick up more general travel information at the Asheville Visitors Center. The bright red trolley you see in the video, the Gray Line Trolley Tour, departs from here. The relaxing tour gives you the chance to hop on or off a number of iconic Asheville spots. Or, ride and learn about Asheville&apos;s past and present. In the video, Sammy wakes up in a comfy bed at the Aloft Asheville Downtown Hotel, voted the Best Pet-Friendly hotel in the United States. When you stay at the Aloft, a four-legged greeter will likely meet you in the lobby. 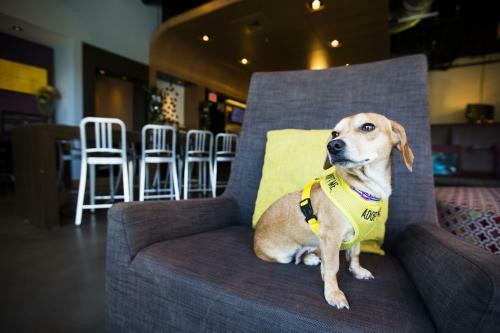 The Aloft has partnered with Charlie’s Angels Animal Rescue on an adoption program that matches rescued pooches with hotel guests from all over the country. While the Aloft especially caters to animal lovers, many other local hotels in Asheville are also highly pet-friendly. Next, we see Sammy head out to explore the streets of downtown Asheville! Take after Sammy and pause along the way, to sit and watch street performers showcasing their skills throughout downtown. 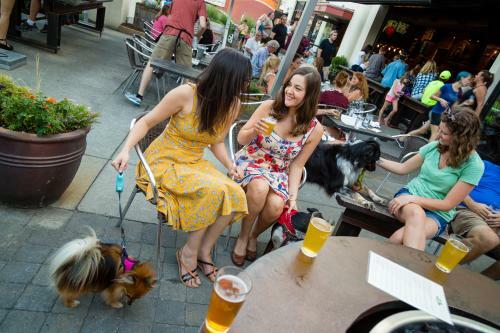 And then, chow down and drink up at one of the many dog-friendly restaurant and bar patios. Need to run around a bit? You see Sammy pass by Pack Square Park, which offers a large green space, perfect for a game of catch! You may have also noticed Sammy with a basket of sunflowers walking through the North Asheville Tailgate market at nearby University of North Carolina-Asheville. Stop over there on Saturday mornings for fresh veggies and treats or choose from one of Asheville&apos;s other 20 tailgate markets. Did you catch Sammy&apos;s run past the giant "Beware of Dog" mural? The sign was painted by artist Randy Shull. And, the abstract painting Sammy admires hangs in Lift Studios and is the work of painter Daniel McLendon. Discover this kind of unique artwork in downtown Asheville and in Asheville&apos;s River Arts District. Stroll into one of the many dog-friendly studios to watch artists at work! 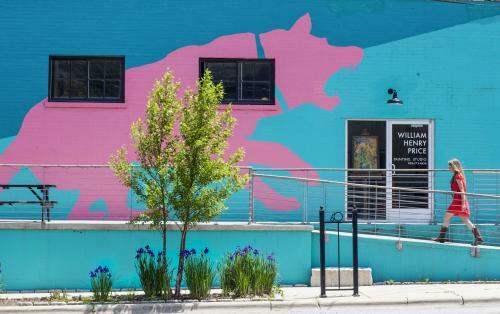 Dog lovers will especially like a walk down Depot Street, where you&apos;ll see the "Beware of Dog" mural and the colorful Pink Dog Studios building (decorated with its own dog-themed artwork). 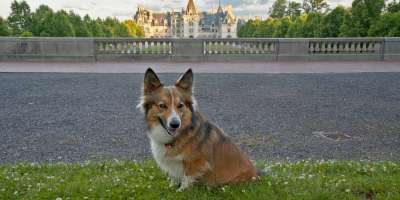 For a change of scenery, explore the grounds of America’s largest home, Biltmore. While dogs aren’t allowed inside the home or other buildings on the estate, Sammy demonstrates how dogs are free to explore the gardens, bass pond, the waterfall, and the trails – much like the Vanderbilt’s St. Bernard, Cedric, did back in the late 1800s! Your dog will feel like the leader of the pack enjoying one of Asheville’s many outdoor adventures! 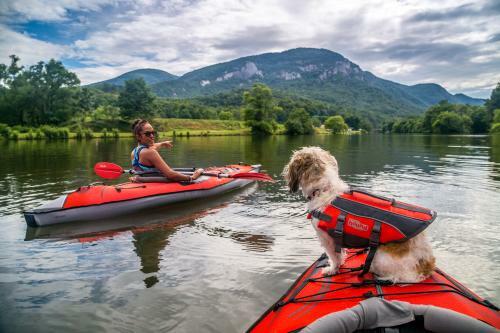 Hit the trails to places like Craggy Gardens (where you see Sammy toward the end of the video) and climb aboard a Wai Mauna standup paddleboard tour on the French Broad River. Early on the video, you also get a glimpse at one of DuPont State Forest&apos;s many waterfalls, perfect for splashing around. When you’re at the tail end of your journey, you’ll be ready to head back to the hotel like Sammy to rest and prepare for another day of Asheville adventure! Photo credits: Top photo courtesy of Matador Network. adopt me photo courtesy of Aloft Asheville Downtown. Patio photo by Nathan Chesky. Pink Dog building photo by Art Meripol, Kayaking photo by Jared Kay.